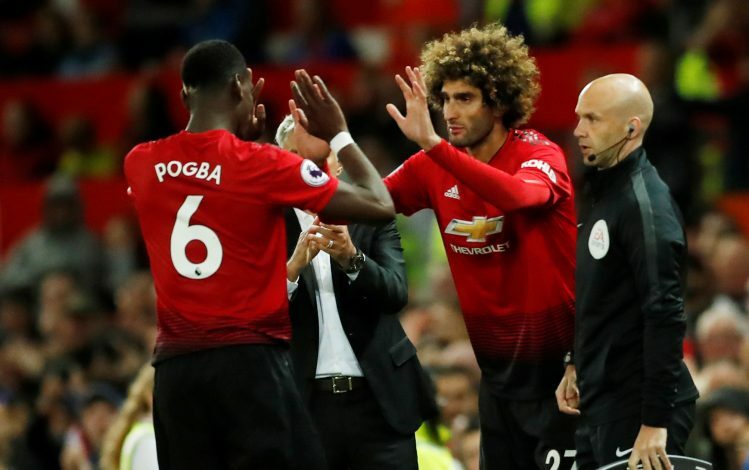 After having shared a largely mixed relationship with the Manchester United fan-base for more than five seasons, Marouane Fellaini finally departed the Old Trafford outfit, securing a move to the Chinese Super League. The Belgian international arrived as David Moyes’ first marquee signing at the club, which led to the player getting strongly associated with the Scot’s failed tenure at the Theatre of Dreams. Further, despite having played a crucial role in the subsequent managerial spells of Louis van Gaal and Jose Mourinho, Fellaini never managed to fit the mold of a traditional Manchester United midfielder. The 31-year-old did pop-up with crucial goals and performances from time to time, but never really became a favourite amongst the supporters. Following the announcement of his departure, however, a majority of the fans expressed their gratitude for his consistent service to the club, whilst also wishing him well for the future. It wasn’t just the fans, however, as Fellaini’s fellow teammates also bade him goodbyes on social media. One such message was posted by Paul Pogba, who had some touching words to say to his now former midfield partner. The Frenchman uploaded four pictures of the two of them together, with the caption: “My bro I wish you all the best in your new club. I’m gonna miss you here man… thanks for all the advise, for your help, only few real real brother in football and you are 1 of them, love my bro”. A genuinely heartfelt message from the World Cup winner, which only goes on to show just how valued Fellaini was in the Manchester United dressing room.